Goodreads launched in 2006, and since then it's become a home to book lovers all over the world. If you haven't given Goodreads a try yet, here are five reasons why it's the best website ever. 1. It helps you organize. I don't know about you, but updating my status with the amount of pages I've read of a book is really exhilarating. Additionally, Goodreads has a feature that lets you set a goal of how many books you want to read in the whole year. It's a really helpful tool to keep you motivated both in the short-term and in the long-term. 3. It helps you look back on what you've read. I'll be honest: some books I might not ever remember I'd read. Some books I might not remember what I thought of them had I not reviewed them. Some books I might not remember the titles of had I not added them to my "to read" shelf. I'm grateful to Goodreads for keeping my head on straight. 4. It connects you to other book lovers. Goodreads is essentially just like Facebook or Twitter but for books. It lets you do status updates about the books you're reading or just in general. You can also comment on other people's statuses, add friends, and follow others. This means it's easy to add new friends or follow the friends you already have. This is one of my favorite Goodreads features since I can keep up with what all my friends are reading and they can keep up with me as well. You can find books that are similar to the ones you've already read. You can find books all by the same author. You can find books that your friends are reading. Overall, you can just find books to read, which is amazing. I've found so many good books on Goodreads that I wouldn't have found otherwise. 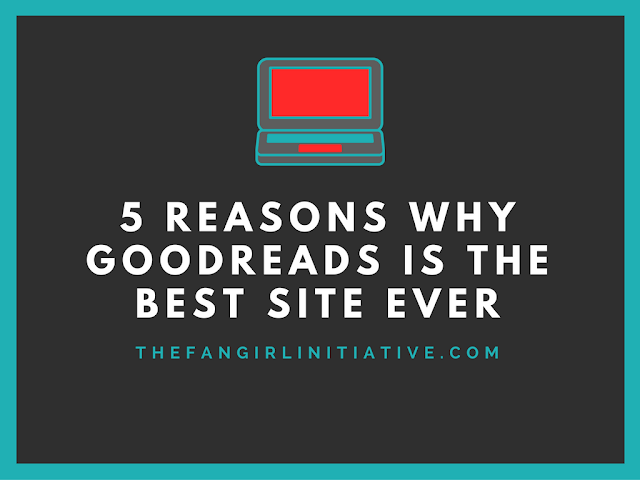 If you're a book lover and haven't discovered the secret treasure trove that is Goodreads, check it out! You'll find that you'll love it just as much as the books you're voraciously devouring. Check out The Fangirl Initiative on Goodreads! Are you on Goodreads? What's your favorite aspect of it? It's my homepage, which says a lot!